We have two charts here, on the left today’s chart of IMG and on the right the chart of silver, the stuff, from October 2012, now more than two years ago. 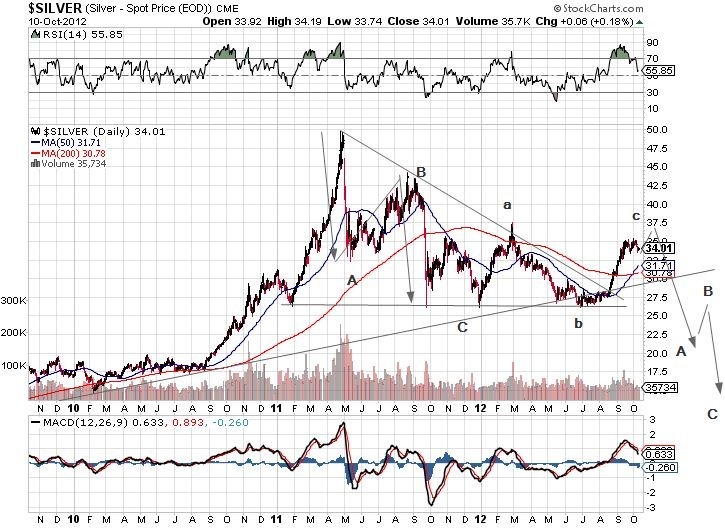 Starting with silver, at the time we assumed a double zig-zag correction was forming. Whether or not that was correct matters less than that the target of about $15 has been dead on so far even if it , arguable, took a bit longer than expected. IMG is interesting in that it has done ALL the basic things one would expect. It is one big a-b-c correction so 1. expect it to go to the 4th wave of previous degree, 2. expect c to equal a give or take, and 3. expect the end result to be horrific. 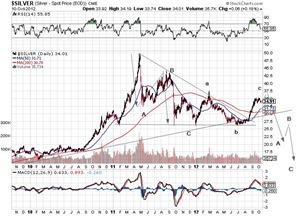 We have them all here so possible this is one precious metals stock that has completed it’s decline. There are many that are close to what we expect to be a bottom and they are simple not going to do it all at once. Others in this league are CFE.A, Central Fund, KGI , Kirkland , ABX almost and so on. If betting on a single stock is not your cup of tee, the ZJG, BMO’s Junior Goldstock Index ETF could be a good choice. 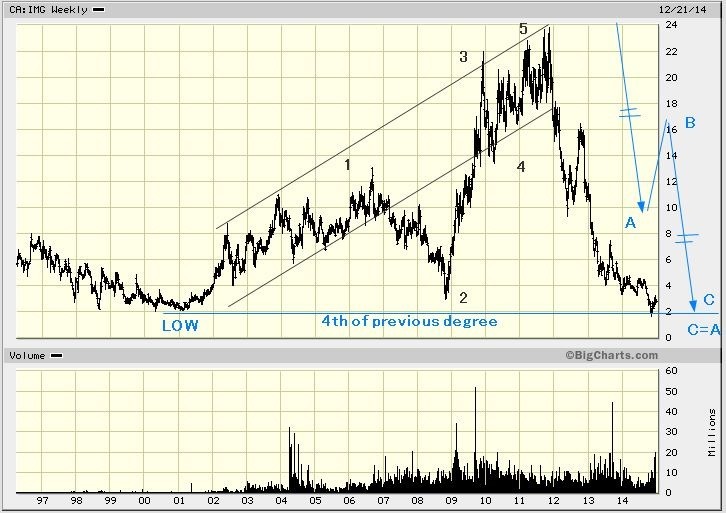 It is trading at 1/5 of its peak value and may have completed the correction, if not it only needs one quick move below $5. Both the RSI and MACD seem to be smiling already.